Acadian Genealogy Homepage; Three Acadian expulsions from Nova Scotia! 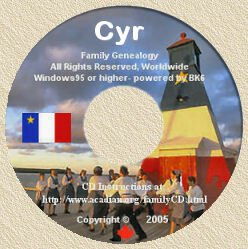 Home of Acadian, Cajun and French-Canadian Family Surnames, Genealogy CDS, Family Crests and Historical Information resources, since 1991. Linking the future to the past........... one name at a time! Since the Acadians who lived in the Cape Sable region, which comprised before their Expulsion the counties of Shelburne and Yarmouth, were not sent into exile in 1755 with those of Port Royal and of Grand Pré, some people are under the impression that they were never expelled. The fact is that there were three Expulsions in the Cape Sable region, one in 1756, one in 1758, and one in 1759. It is a fact, though, that these Acadians were not molested in 1755. A certain number of Acadians from Port Royal and the Minas region, having heard that these Acadians had been left alone, came down through the forest to take refuge in what they thought might be a safe haven. But they were wrong. In reality, Lieutenant Governor Lawrence did not know at first that there were Acadians in this region. But on April 9, 1756, he wrote to Preble, commanding officer of a batallion from New England who had come to give a helping hand to Lawrence in his plan to expel the Acadians, telling him that he had learned that there were still some Acadians in southern Nova Scotia. He was asking him to take them to Boston, after burning and destroying all their buildings and confiscating all their belongings and domestic animals. Preble left Halifax, accompanied by several vessels. He arrived at Port La Tour in the evening of April 21. As the Acadian establishments were on the other side of the Baccaro Peninsula, all along Barrington Bay and Barrington Passage--Villagedale, Barrington, Sherose Island, Doctor's Cove, Shag Harbour--he had to cross the peninsula to get to them. April 24, on board The Vulture, he writes to Lawrence, telling him that, after a tiresome voyage, he arrived at Port La Tour on the 21st and disembarked 167 soldiers. At night, they crossed the peninsula on foot and surprised the Acadians in their bed. They set fire to 44 buildings. Then they walked the prisoners to the several vessels which were awaiting them at "Baccaro Passage." They were 72 in all. The vessels arrived in Boston between April 28th and April 30th. Lawrence had entrusted Preble with a letter for Shirley, Governor of Massachusetts, telling him that if he did not want to accept these Acadians, to send them to North Carolina. But Shirley thought that he could not accept more French Neutrals, as they were called, than those that were already in his territory. So a vessel was hired to take these Cape Sable Acadians to North Carolina. The captain of this transport was to deliver a letter to the Governor of North Carolina telling him that, if he did not want to accept them, to tell the captain of the vessel what to do with them. The vessel was supposed to leave on May 11. All that time, since their arrival, these Acadians had lived on the vesssel or on the wharf. After they were embarked in the vessel which was to take them to North Carolina, they heard the captain giving orders to cast off and learned only then of their destination. Right there and then, "a Great Dessension" rose among the Acadians, who forced their way on the wharf with their luggage. They said they would rather die on the wharf of Boston than go to North Carolina. At the same time, they sent a letter to the Governor of Massachusetts and his Council, telling them that to send them to North Carolina was to condemn them to death, as there, they would not be able to do what they were accustomed to do for a living, that is fishing. In Massachusetts, they would be able to work for their living. May 14, Thomas Hancock, who had been appointed to furnish with supplies the British troops in Nova Scotia, intervened in their favor, asking the Governor and his council to allow them to stay fourteen more days at his own expense. If after that time it was to be decided that they should go, he, himself, would hire a vessel and would see to it that their demand would be fulfilled. May 27, Thomas Hancock told the Governor and his Council that he was ready to hire a vessel to take those Acadians to North Carolina, while giving a sad picture to their state, even pleading to let them stay in Massachusetts. A committee was appointed to study this matter. They gave their answer the very next day, May 28; they proposed that they should be placed all along the coast, between Plymouth and Gloucester. This was met with the approval of the Governor and his Council. This is one of the rare occasions when the Government showed itself sympathetic to the Acadians. I want to note, though, that it is a fact that the Acadians had little to complain with regard to the Government of Massachusetts, except for the orders that oftentimes was given to separate from one another the members of the same family. But, with regard to the people under whose supervision the were placed, too often it was another story. Thanks to the Massachusetts Archives, which contain about two thousand documents relating to the Acadians in exile in that State, we can follow very accurately the places where each and everyone was during their stay in Massachusetts, their way of life, their demands, their frustrations, their sufferings, their sicknesses, and we know who were those who could not make it and departed for a better world. They were to stay in Massachusetts, some till 1766, others till 1775, at the eve of the American Revolution. In a subsequent article, I will let you know how the ancestors of today's Acadians of Yarmouth County made their return. Although the raid of 1758 in the Cape Sable region, which lead to the second Expulsion, brought into exile less Acadians than the two others, that of 1756 and that of 1759, nevertheless it was of the three the most devastating, the most widespread, the one which also lasted the longest, when from the middle of September to the end of October it brought destruction from Pubnico to Chegoggin, plundering all that could be destroyed and reducing to ashes all that could be burned. After the Acadians living in what is now Shelburne County had been taken into exile in 1756, Lawrence learned that there were still other Acadians in what is now Yarmouth County. In fact, they were established in Upper East Pubnico, along the Argyle River, including Robert's Island, in Chebogue and in Chegoggin. This raid was under the direction of Major Roger Morris, captain of the 35th regiment of the British forces in North America, who was acting under the command of Colonel Monckton, Lieutenant- Governor of Nova Scotia. Morris left Halifax on September 11 for Cape Sable, with 325 soldiers. His Fleet consisted of two men-of-war, to which were joined on their way a transport ship and a pilot ship. They came to anchor at the mouth of the Argyle River in the evening of the 15th. Right away, Captain Gorham left with 40 to 50 rangers to explore the region. He came back the next morning, having found fields of potatoes and of tobacco, but no trace of the Acadians. They proceeded towards Frost Corner, where they found other fields which had been worked very recently. Next day, the 17th, Captain Watmough took through the woods towards Pubnico. Having noticed an agglomeration of houses on the east side of the harbour, he came right back to tell Morris about it. Morris, after destroying the gardens where he was, left Frost Corner, and at noon, September 20th he anchored his Fleet smack in the middle of Pubnico Harbour. Immediately after disembarking, they started to follow the trail that they had found of the Acadians, leading to Pubnico Head and about five miles further in the woods, till they lost their trace. Not being able to find the Acadians, Morris sent a hundred men on the west side of the harbour where they had spotted two houses on the elevation where is located the Old Cemetery. They burned those houses and ravaged the gardens adjoining them. This was taking place of Friday, the 22nd. Next day, they proceeded to pillage the village in East Pubnico and to ransack all the buildings, including the Church, the priest's rectory and the Manor House of the d'Entremont family, all being located north of Hipson's Brook, also all the other houses, barns and sheds. After devastating all the cultivated gardens, Morris embarked most of his men, leaving to Gorham the task to set everything of fire. By 11 o'clock that morning, all had been consumed. Morris would have liked to depart right away, but a gale of hurricane force retarded his departure till the following Saturday, Sept. 30, when he headed for Schooner Passage and Chebogue Point. Right away Gorham was sent to explore the Acadian settlement at Chebogue. The next day, which was a Sunday, he reported to Morris what he had seen, and left the same day for more explorations, taking enough provisions for four days. He was accompanied by 20 rangers, who were joined on Monday by 72 more. Wednesday, Oct.4, Gorham came back and gave to Morris the following account: Nine houses with chimneys were burned, plus one Mass House, nine barns and sheds and six haystacks; were taken or destroyed twelve sheep, about fifty bushels of potatoes and turnips. He added that they had found human and animal traces up the river, which were still fresh. This being done, Morris kept on with his Fleet and entered Yarmouth harbour. This was Sunday, Oct. 8. Gorham, with two whale-boats kept on sailing up the river till he arrived at the Acadian settlement of Chegoggin, that he discovered by chance. That Sunday afternoon, he surprised Father Desenclaves in church with his congregation, consisting of nine families, comprising 61 persons in all. The church stood on top of a beautiful knoll, west of the river, facing the site of the old gold-crusher which used to be on the other side of the road. A mother with six children joined them, making a total of 69 persons. Gorham learned from father Desenclaves that there were still 21 Acadian families and six Indian families up the Tusket River. After confiscating all the arms that he could find, Gorham locked the chapel with all the Acadians in it. He sent immediately a message to Morris, asking for help. It took about all week to pick up the vegetables from the field and gather the domestic animals. In the meantime, Father Desenclaves, to avoid the wrath of the oppressors, felt that he had to reveal where stood "The Tusket Village," as it is called in documents, which was located about 15 miles in the interior, north of and at the head of Lake Vaughan, somewhat downstream at the small bridge which spans Reynard's Falls. This is where Father Desenclaves himself resided. They took him with them by boat. After searching all around and not finding the Acadians, they razed everything, leaving but ashes and dust. It was not before the 28th which was a Sunday, that the embarkation took place, but it was only for the women and their children, because their husbands and their sons had been kept by Morris to help him "finish the job" at their settlement. A detachment was to stay to ravage all that was "acadian" in the region. It was reported that several "uncommonly large fires" could be seen from Annapolis on November 17, supposedly to have been "occasioned by parties from Cape Sable detachment, who were burning settlements and clearing the country." Tuesday, Oct, 31, the Fleet left Yarmouth Harbour with its cargo of 68 Acadians, with Father Desenclaves. They were confined in Halifax till the beginning of the following year, when they were sent to France, where those who had survived arrived February 16. We saw in last week's sketch that Father Desenclave had told Captain Gorham that there were 21 Acadian families up the Tusket River, whom Gorham was not able to apprehend. He told Major Morris that there were 130 Acadians in all. We do not know if we're [sic for were] included in this number, the Acadians from the settlement of Pubnico, of Argyle and of Chebogue. If so, it was surely not all of them, if we judge by the number of Acadians who were of this third Expulsion. Gorham, in October, 1758, had sent an Acadian with a letter addressed to those who were hiding in the woods, whom he summoned to give themselves up. On their part, they sent him a letter, telling him that they had written to the Governor of Massachusetts to see to it that they would be able to stay on their lands or at least to accept them in his territory. We have a copy of this letter of the Acadians, which is in English. It is dated from "Cape Sables, September 15th, 1758", and addressed "To His Excellency Thomas Pownall, esq. and Honourable Council in Boston". Here are a few excerpts... "If it might please your Excellency and worthy Council to settle us here in this land where we now live we shall ever hold our bounded duty to love and honour you with our last Breath, and ... we are heartily willing to do whatever you require ... also willing to support and maintain the War against the King of France ... We are in all about 40 families which consist of about 150 souls ... We beg that if we may no longer stay here that we may be received into New England to live as the other Neutral French do for we had all rather die here than go to any French Dominions to live." It is signed Joseph Landrey. The previous Winter had been exceptionally long and severe. These Acadians were not able to face again such a Winter in the woods; that is why they were ready to do anything to avoid another harsh Winter, anything except to fall into the claws of Lawrence, who was regarded by the Acadians as a heartless tyrant. The letter was given to Mark Haskell, a merchant who was dealing with the Acadians of Cape Sable. He was to convey it to the Governor of Massachusetts. No doubt that the letter had been written by Haskell himself, as he says: "The foregoing is what I received from the mouths of Joseph Landrey and Charles Dantermong, two of the principal men of Cape Sables." Pownall was very sympathetic to the plea of the Acadians. He would have wanted to send someone right away to get them. But his Council was of another opinion. Their argument was that these Acadians were "enemies of the Crown." In reality, having lived for 45 years under British rule, they were British citizens of Nova Scotia. But since they had pledged to stay neutral in case of war (notwithstanding what is said in this letter) and being of French extraction, they were considered to be more partisans of France than English subjects. Moreover, England and France were at war since May 17, 1756, the Seven Year War. Thus Massachusetts could not give shelter to these "enemies." As a consequence to these deliberations, the Council found the Good Samaritan Mark Haskell guilty of dealing with the enemy. He was thrown in prison for his good deed. Pownall, on his part, had only one thing to do, send the Acadian letter to Lawrence, which he did, although reluctantly. January 2nd, 1759, he writes: "For the case of the poor people of Cape Sables it seems very distressful and worthy any relief can be afforded them. If Policy could acquiesce in any measure for their relief, Humanity loudly calls for it." All that time, the Acadians were to spend an atrocious Winter in the woods, when some of them were to die of hunger, of cold and even of grief. Receiving no answer to their plea, they became desperate, so much so that, notwithstanding how much they dread to give themselves up to Lawrence, they sent at the beginning of Spring a few of their companions to Halifax with the offer to put themselves in the hands of the British authorities. Lawrence, realizing that there was no escape for them, was not in a hurry to go to get them. It was only at the beginning of Summer that he asked Major Erasmus Philips, who was in Annapolis, to take those "Lands ruffians, turned pirates" to Halifax. The task of picking them up was entrusted to Captain Gorham, the same one that we saw last week who apprehended most of the Acadians who were sent into exile in France in the Fall of 1759. He arrived in Halifax with them on June 29th; they were 152 in all. They were placed on George Island, in Halifax Harbour, where there were already six Acadian prisoners from the St. John River. Here, where they were to stay till November, they had much to suffer, sleeping "under the stars", most of them not having anything to cover themselves, their clothes having been taken away from them. Eight died on the island; there was one birth. They were scheduled to be shipped to England November 3rd. They had already boarded the "Mary the Fourth", when, that same evening, rose one of the worst storms ever to hit the coast of Nova Scotia. The departure was postponed till the 10th. They arrived in England seven weeks later, on December 29th. Finally, they disembarked in Cherbourg, France, on January 14 (1760). Four had died during the crossing. We still have eight letters, originals, written between this date and 1775 from Cherbourg by members of the d'Entremont family to their very close relatives who returned to Pubnico. Even a hundred years ago, some people from Pubnico were still corresponding with descendants in France of these exiled Acadians. At the time of the Expulsion of the Acadians, there have been two escapes from two forts located each side of the Missaguash River, which makes the boundary between nova Scotia and New Brunswick. One was from Fort Lawrence, located in Nova Scotia, on route 104 or the Trans Canada Highway, four kilometers west of the limit of the town of Amherst. The other was from Fort Beausejour (which was called later Fort Cumberland), in New Brunswick, just south of the Trans Canada Highway, two kilometers from the border. The escape from Fort Lawrence took place during the night between the 1st and 2nd of October, 1755, while that from Fort Beausejour took place during the night between the 26th and the 27th of February, 1756. The account of the escape from Fort Lawrence comes mainly from one of the grandsons of one of the prisoners, who heard it from his grandfather. July 23 1755, Charles Lawrence, governor of Nova Scotia, sent secretly a message to all the military posts in the Province that it had been decided to do away with the Acadians by embarking them in vessels and sending them abroad, mainly on the coast of what is now the United States. A couple of weeks later, all the men living in the vicinity of Amherst were summoned to gather at Fort Beausejour, to discuss matters relating to the Oath of Allegiance to the Sovereign of England. On the 11 of August, 250 Acadians arrived at the fort, all men, and were immediately incarcerated. As they were too numerous to be held in one fort, the majority were sent the same day to Fort Lawrence. The following weeks, other Acadians were apprehended, and it kept on up to the month of October. This is, in fact, what we read in Dr. John Thomas' diary, which he kept at the time. On August 11, he writes: "Colonel Muncton got 250 of the inhabitants into Fort Cumberland and confined them Major Bourn with 150 men guarding the greater part of them to Fort Lawrence where they are confined." After much debate, the wives and relatives of the captives were allowed in groups to visit them, now and then. In doing so, they were able to conceal different objects which they thought would be useful to the prisoners. Tradition tells us that some brought women clothes so that some of the prisoners, under a feminine disguise, would be able to walk out of prison with them. And sure enough, some were able to deceive the guards and make their escape. But it happened that one of these escapees was limping. The guard who had let the women in, recalling that none of the women who had gone in were limping, became suspicious; the trickery was easily discovered. From then on, nobody was allowed to visit the prisoners. If the officers of the fort were frustrated for having been duped by this strategem, they were to be much more baffled by what was to take place a short time later. One morning, one of the guards making his rounds, went down to the cellar where the prisoners were kept, and what was his surprise when he found the cellar completely empty. How could all those prisoners, 86 of them, escape without being noticed by the sentry? It was, for a while, a complete mystery. Finally, a hole was discovered in the ground which ran under the walls of the fort. It was figured that the prisoners were there hiding in it. The officers sent one of their men in the hole to investigate. He entered the hole with great difficulty, as it was narrow. He could only go a few feet, when he felt that he was caught, no doubt still wearing his heavy uniform surrounded and squeezed by dirt. The story goes that, even though those who stood by did what they could to pull him out, he suffocated and died. What really happened is this. A woman or several of them, while visiting their husbands, hid small instruments, like knives and spoons, in the loaves of bread that they were bringing them. With these small rudimental "implements," the prisoners started to dig a hole in the ground. They kept on unceasingly, no doubt day and night, each taking his turn, being notified by others when the guard was approaching to make his rounds, till finally after weeks, no doubt, they reached the ground outside the walls of the fort. The dirt that they dug out was concealed under their beds. When all the work had been completed, they chose a very stormy night to make their escape; it was the night between the 1st and 2nd of October. Dr. John Thomas wrote in his diary October First: "Stormy dark night eighty six French prisoners dugg under ye wall att Foart Lawrence and got clear undiscovered by ye Centry..."
The smaller ones of the crowd went first through the tunnel, each of them rubbing off some of the dirt and making the passage a little larger. It must have taken most of the night for everyone to get out. According to tradition, the last one to leave the cellar or prison was an Acadian named Réné Richard. He told the story to his grandson, Joseph L. LeBlanc, of Memramcook, many times. This story, that I read in Placide Gaudet's papers, the eminent Acadian genealogist, Gaudet got it directly from this grandson. No doubt that these poor Acadians ran to hide themselves in the woods. But finally, they were to be caught again; some even, in despair, rendered themselves to the English authorities, so not to die of hunger or freeze to death. We have the names of most of these prisoners and we know where they settled after the Expulsion, most of them in New Brunswick. Click here for details of the escape of 80 Acadians, from Fort Beausejour. We know that at the time of the Expulsion of the Acadians, many of them took to the woods. Some were caught in their flight; others succeeded in reaching "Canada" (Québec). Among the accounts that have come down to us, there is one which tells us of the flight through the forest of some ten families of Belliveaus, Gaudets, Bourques, etc., who, after struggling a whole year in the woods, finally reached the St. Lawrence River. We owe this account to an old Belliveau grandmother who, many years after, related to her grandchildren this flight, with many details. Around the end of the summer, 1755, when they learned that they were to be embarked on ships and sent to some far away places, these families took to the woods. It could be that, after spending a harsh winter they decided to try to reach Québec. They figured that by following the Indians, they would be able to do so. But the Indians did not venture far from the coast. Moreover, the Indians, while the men were out hunting for food, were somewhat impertinent towards the Acadian families. That is when they separated from them and tried their luck through the forest without their guidance. Among them were old people, pregnant women, small children and even babies, without counting those who were cripple. Women carried their younger children on their shoulders, men carrried the luggage, cleared the way from shrubs and thickets, explored the premises, avoided swamps, did some hunting and fishing, and, as the sun went down, prepared the encampment for the night. The march was very slow. Many times they had to build, with an axe and knives, a rudimental emergency raft to cross the many rivers that they met. Hunting was done with bow and arrow, becuase they did not have any firearms; they set traps also. They managed to fashion hooks for their fishing lines. They fed on all kinds of wild animals that they would catch, beavers, partridges, fish, etc. In summer, they ate also herbs and berries. In the morning and in the evening, when the birds announced the dawn of day or when the evening twilight started to overshadow the surroundings, all knelt for the morning or evening prayers, commending themselves to Almighty God for a peaceful night or for a safe journey during the day ahead. It is a miracle that they were able to journey on, after weeks and weeks, surrounded by perils at all times, without real harmful occurences, although they were pressed continuously by poignant anxieties. It seems that they had undertaken their journey late in spring or early in summer. In October, not having yet reached the St. Lawrence River, they started to worry, wondering if they would have to spend another winter in the forest. The days were getting shorter, and finally the snow started to fall. What were they to do? Encouraged by those who were stronger, more ambitious, more resolute, they kept on, taking a day at a time, and that until close to the end of October. Finally, "three days before All Saints' Day" (October 29) they arrived at Cacouna, just below Rivière-du-Loup, about more dead than alive, but grateful for having reached at last wide open spaces, and civilization. They were to winter here. In the spring they were again on the move, when they started to row up the river, towards Montreal. Finally they reached St. Gregoire, fifteen miles south-east of Monteal. They might have heard that there were already there some Acadians of the Dispersion, maybe some of their relatives. Mrs. Belliveau, from whom we hold this story was not in the group who had made this journey, but she had gotten all the details of the flight from her neighbours, at St. Gregoire, whom she had herself joined after having been sent into exile in one of the southern colonies, along the Atlantic coast, where she lost her husband. After some time, she was able to reach Boston and join another caravan who also journeyed towards Montreal. Luckily enough, she found here some of the husband's relatives. Some years later, her children and grandchilden whom she had not seen for a long time, joined her. They are the ones who jotted down her account for posterity. She "died in their midst" of a ripe old age. Friday, September 5, 1755, the Acadians were taken into custody by the British under Lieutenant Colonel John Winslow. Saturday - September 6, 1755 The LEOPARD - Captain Thomas Church arrives at Minas Basin. Friday - September 19, 1755 - 230 prisoners had embarked and 300 or more returned from Halifax and were placed aboard ships. The whole population of Minas, about 2,000 (excluding Cobequit and Piziquid) was under armed force of 363 men. The wives and mothers of the captives were allowed to go aboard the ships to bring food. Saturday - October 11, 1755 - The transports were made ready and during the months of October and November, in the midst of mass hysteria and Francophobia that followed the defeat of Braddock and the prejudicial reporting of the Maryland Gazette, and when the excitement was on the increase and the minds of the peolple of Maryland were occupied with these real or imaginary dangers, that were supposed to be so near at hand, the sailing of the ships of the expulsion began the operation of expelling some 913 Acadians to Maryland. Monday - October 13, 1755 - The sailing orders for the Leopold were givin to Captain Thomas Church by John Winslow. The same orders were given to Captain Milbury of the Elizabeth. "I am at this moment embarking the people on board two sloops: the "Three Friends" and the "Dolphin" and had I vessels they should all go on board tomorrow. The third Sloop you said you would send me has not yet arrived. I earnestly entreat you to send her with all dispatch. The season advances and the weather is bad, as for Davis, he is gone away without my knowledge by which means I can do nothing. I am afraid the Governor will think us dilatory. My people are all ready and if you think I may venture to put the inhabitants on board "Davis" I will do it. Even then, with the three sloops and his scooner they will be stowed in bulk." Thursday - October 16, 1755 - Captain Murray further states: "Two days later, on October 16, 1755, the other transport "Ranger" arrived (in Pisiquid). Note: The above dates will have to be checked out. Earlier reports have the ships being loaded on October 27, 1755 and embarking on October 28, 1755. Monday - October 27, 1755 - 493 Acadians from the parishes of St. Famille and L'Assomption in Pisiguit - and 420 Acadians from the parishes of St. Charles in Grand Pre and Riviere-Aux-Canards and St. Joseph in Grand Pre (for a total of 913 Acadians) boarded six ships, with orders that two persons per ton burden were to be placed on the transports, and sailed for Maryland. Among them were the Ranger, (90 tons burden, Francis Peirey, master) with about 323 (or 263), 83 over her compliment aboard, and the Dolphin (87 tons burden, Zebad Farman, master) with 227 (or 230), 56 over her compliment aboard. These two ships embarked from Pisiguit, under the direction of Captain Alexander Murray. The embarkation began on Wednesday October 8, 1755 and continued until Tuesday the 28th of October, 1755. In order to hasten the undertaking, the ships were overloaded and to make room for even more, the Acadians were forced to leave practically all of their goods on shore, where they were found still lying on the shore by the English settlers who came six years later. The livestock throughout the Minas, which were estimated at over 118,000, were left to roam aimlessly in the fields, but were later dispersed amongst the New England settlers, who had been referred to earlier as "proper British subjects". Many other homes and structures were burned later, leaving no trace of the 75 years of Acadian occupation in the area. On Tuesday December 9, 1755 the inhabitants of Port Royal and the remaining 900 from Grand Pre were deported. Saturday - December 13, 1755 - In Grand Pre, there were some Adacians deported on the scooner DOVE and about 200 on the Brigantine SWALLOW. Saturday December 20 - 120 Acadians were deported on the scooner RACEHORSE and 112 on the scooner Ranger, for a total of 732 that were embarked on the wintry nights of December, 1755 from Grand Pre. Virginia refused to accept the 1,150 Acadians that were sent to them, so they were sent to England. Thursday April 23, 1756 "An Act to impower the Justices of the several County Courts to make provisions for the late inhabitants of Nova Scotia, and for regulating their conduct". The Acadians had regarded themselves as prisoners of war and were entitled to be supported as such, but the authorities would not accept this because it would be their responsibility to care for them. With this Act, except for those unable to because of infirmity, to be supported by themselves and labor for their own support, or be compelled to do so and, the children of those who were unable to support their children, were bonded out to those who could or would support them. Likewise the orphans were also bounded out. The Acadians were also ordered to render an exact list of their men, boys and girls and were not allowed to wander more than ten miles from their abode, or out of the county where they resided without a pass from the Priovincial or County Magistrate describing the person, residence and time and place of destination. Thursday May 14, 1756 - In Acadia, Lawrence set up a bounty of 30 pounds sterling for each male scalp over 16, and 25 for younger males or women and children. Although this was ostensibly limited to Indians, in practice, the English paid the bounties without inquiring into the race of the original owners of the scalps. Wednesday May 27, 1756 - The Acadians were quartered virtually as prisoners, not to leave town without a written permit of the selectmen under penalty of five days in prison or ten lashes. they depended on the cold hand of the public for food clothes and lodging and were given some provisions. (27 May 1756, Proceedings and Acts of the General Assembly of Maryland -[Baltimore, 1930] 24: 542 ff. - also Sollers "The Acadians (French Neutrals) Transported to Maryland" - Maryland Historical Magazine 3 (1907): 18.